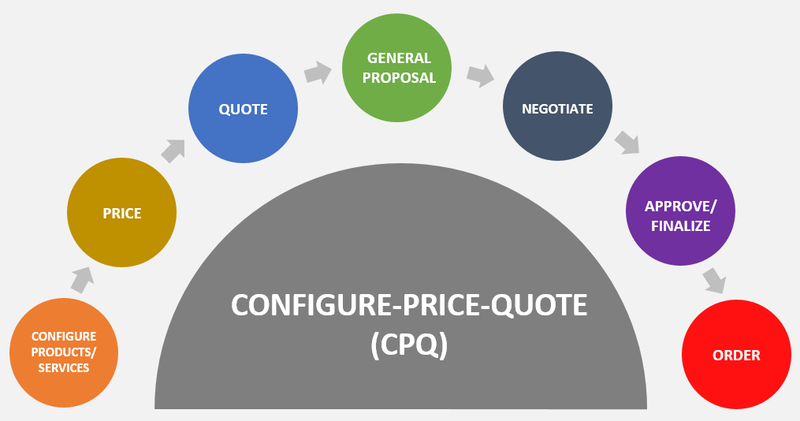 What is Configure Price Quote (CPQ)? Configure price quote (CPQ) is an industry term for software solutions that help companies to streamline some of their core processes around the prices that they set for customers. CPQ software can help companies configure products or services in the most optimized way, pricing according to internal factors such as cost, discounting, etc. CPQ software can measure external factors such as competition and other economic conditions in order to produce accurate highly configured quotes. As companies and their product/service lists grow, it becomes increasingly difficult to manage product pricing, identify great upsell opportunities, and keep track of deals being offered by your competition. Often, sales reps aren’t provided up-to-date pricing information on products, which can lead to lost opportunities and slower quote times. Configuring a quote can be a time-consuming task, especially when critical data is not easily accessible in real time. What are potential benefits of CPQ software solutions? CPQ software addresses these variables by allowing companies to come up with accurate price quotes sans errors. With built-in analytics, your reps can discount smarter in order to stay ahead of the competition no matter how complex your business becomes. These solutions may offer additional margin protection, control discounting, enable faster quote preparation and approval turnarounds. CPQ software can eliminate these problems by speeding up sales cycles, ensuring pricing data accuracy, and identifying and opportunities to upsell and bundle. At the same time, a company can prepare orders faster without increasing the potential for error. As pricing data is more streamlined, the workflow is streamlined, time is saved and more sales can be made. Large companies that manage thousands of products and SKUs due to discontinued items or discounts, or sales teams that may not have the data needed to provide accurate, up-to-date sales quotes (for bundles or upsells) are great business examples of when to use CPQ software. Also, companies that operate on a global scale and need to provide quick and accurate pricing data to dozens or hundreds of stores may find CPQ software most effective at managing pricing discrepancies. Companies can lose a lot of money with a lack of accurate sales quotes. According to the Aberdeen Group, the sales cycle can see a 28% reduction with CPQ, thereby positively impacting sales rep productivity. Remember to Analyze Sales Performance: Get visibility into real-time activities of your sales reps with analytics. Meet sales goals by tracking product & pricing trends. CPQ turns limited visibility into real-time data/analytics for sales reps. Meet sales goals by tracking product & pricing trends. CPQ makes the journey from quote-to-contract much easier by connecting contract and sales process, so you can win deals faster and sell more. So, when do you know that your CPQ should be evaluated? Difficult monitoring competition, industry changes, sales, etc. Learn more about CPQ and core pricing skills in Dallas, Texas this Fall for the 29th Annual Fall Pricing Workshops and Conference event! Master skills in-person including core pricing and CPQ strategies. Attend the Workshops and pass the course tests to receive credit towards your CPP Designation. Click to learn more! Companies use CPQ in business to maximize pricing impact and strategic solutions. How does your company use CPQ?